As summer arrives, public school teachers breathe a sigh of relief and homeschoolers begin planning season. 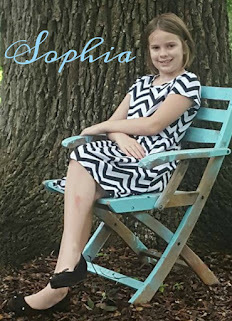 With Memorial Day out of the way and the "official" beginning of summer right around the corner, I thought it would be timely if I posted about how I plan our homeschool year. When it comes to homeschooling you can find lots of options for how to schedule your year. I'm going to talk about the three most common year plans. Following the Calendar Year. We will probably not finish up our current school year until early November due to vacations and rabbit trails, so I'm planning on starting new material with both of the girls in January. We take the month of December off because it is such a busy, hectic time of year. This type of homeschool is much less common, but the people who homeschool this way seem to really enjoy it. I guess we will join their rebellious ranks this next school year! Whatever you do, please remember to check the homeschool laws for your state to make sure your year plan is legal. First, I print out a year at a glance calendar for the upcoming school year, whatever you have determined that to be. 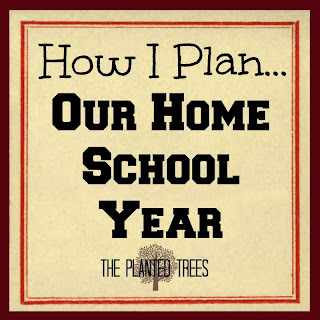 If you are starting your homeschool in the months of January, June, July, August, or September, then I recommend using Donna Young's Year At A Glance Calendar. If you are going to start in any other month of the year, then I suggest Homeschool Classifieds' Year At A Glance Calendar (Second Option). With this calendar, you can choose any start date of the year you would like. I will be using Donna Young's calendar starting in January of 2013. Now mark off any days/weeks/months that you know you will be needing to take off ahead of time. I will mark out the entire month of December, Thanksgiving, my children's birthdays, Vacation Bible School week, the week of dance recital, and the week of Spring Break when my parents and sister come visit. There will be other things that come up over the year, but this is just the things that you know about. Even if you do not know the precise dates yet, but you do know that you will be involved in the event, mark out the dates close to when you think it will be. You have some options at this point depending on how you want your year to flow. Do you want scheduled break weeks like I mentioned above or more fly by the seat of your pants (like we do). I will use my calendar to show both approaches. I am going to pretend like we are going to do the four weeks of school, then one week off schedule. First, I number all of the blank weeks following my schedule, four weeks of school and one week off. Use a pencil because you will be erasing. Eventually you will run into the following situation where you have an off week very close to one of your blacked out days/weeks. You can see in the picture above that I have a scheduled break week only one week ahead of a planned break. You can do a few things here. You can choose to school those two weeks and take your scheduled break the week of the planned break. You can take the scheduled break and just school for one week before the planned break. If this was my calendar, I would school the week you are supposed to have off, then take my scheduled break the next week followed by the planned break so you would have two weeks off in a row. I chose this option because the week that is blacked out is when family is coming to visit, so taking the week off before gives us time to clean house and get ready for their visit. Also, this would be the month of March so the weather will probably be very nice and spring fever would be in full force so it would do us good to get out and take a couple of weeks off of school. Continue numbering the weeks on your calendar following your year plan. Once you reach the end of your school year, look at the total number of weeks you will have to complete your work. I now know that I have 38 weeks to complete our curriculum. Most curriculum is scheduled for a 36 week school year, but some are 34 weeks or any other variation. This gives me a two week to four week window for illnesses, unexpected interruptions, or just to finish the year early. What I like to do is take the total number of days that I want to school or need to school (by law) for the year, then divide it by how many months I will be schooling. That gives you a base number of how many days you need to school each month to be completed in one school year. That way when something unexpected does come up, you know the bare minimum you need to do that month, even with life's interruptions, to stay on track. For example, let's say that I'm using a curriculum that is for 36 weeks and five days a week: 36x5= 180 days. I will be schooling for 11 months according to my calendar above: 180 days/11 months=16 days a month with four days to squeeze in. What this tells me is that I need to complete at least 16 days of school each month. I like to look at this breakdown so that I can quickly tell if we are on track, ahead, or getting behind. All of the above is for those who want to use scheduled weeks off. Like I said, that didn't really work for us. So if you are more of a fly-by-the-seat-of-your pants kind of person who wants minimum structure, this is how I break down our year. I use my calendar that has the dates blacked out and begin numbering the weeks that are empty, but I don't schedule any breaks. At the end I see that we have 44 weeks that are free and clear for school. Next year I am planning on schooling 34 weeks of lessons for 4 days a week (there are no required number of days for homeschoolers in our state). Now I will use my little formula from above to figure out how many days we need to school each month to finish in our year. 34x4=136 days. We will school for 11 months. 136 days/11 months= 12 days each month with 4 extra days to fit into the schedule. Now as I keep track of their attendance all I have to do is make sure we get at least twelve days completed each month. If someone gets ill, we just make it up. If we want to take the day off, then we can. No pressure...just make sure we get those twelve days, then we are good to go! And if we get more than twelve days each month, then we just finish early and start a new school year. I mentioned above that we are only going to be schooling for four days a week next year. How did I decide to do that and why? This next section is going to be about planning how your week will flow. We've planned our year and hand in hand with that we've kind of planned out the months, so on to the week. Now I start listing weekly commitments, spouse's work schedule (if it's unusual instead of the typical 9-5), and your work schedule (if you work part time or full time) that you will have for most of our school year. We have our homeschool co-op on Friday that lasts from 10:00 until 3:00, so I will plan on not schooling that day, which means we are only having school for four days a week. I could make up that day on Saturday, but honestly, we won't do that since my husband is usually home that day. The other thing that I notice from writing this out is that if I need a day to work on an extra long project, add in an extra subject, or make up some lost ground, then Tuesday is our day since we have no outside commitments that day. The other thing that you need to plan about your week is what days you will be homeschooling. As I mentioned above, Monday-Friday are not the only days you can school. Feel free to add in weekends or move things around. This is especially useful if your spouse does shift work or doesn't have a typical work week. When mom or dad is off, then the children can be off from school, even if it happens to be a Wednesday and Thursday. That is one of the benefits of homeschooling...flexibility. Remember the law. 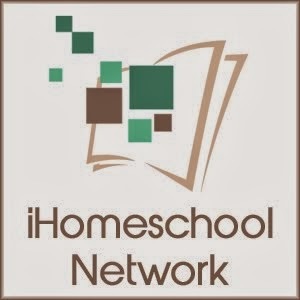 Some states require homeschoolers to log a certain number of hours each day. All of that doesn't have to be sit at the desk and do workbooks to count as school. A nature walk through the neighborhood, helping cook lunch/supper, and a thousand other things could be counted as school time. Overestimate the time for each subject. If you think that math will take 30 minutes, then you better make it 45. If you are counting on history being a 20 minute lesson, then make it 30. Start out your planning overestimating everything. Then your first couple of weeks time how long it really takes you. I usually discover that things I thought would take very little time are taking much longer. This helps you to streamline your day and adjust. Repeat this cycle until the child is done for the day. I want to remind you though that this is my plan for my children. Even I adjust this for my kids. If your children want to work longer, then do so. If they need a longer break, then let them have it. Let your children lead how much they can do at a time (within reason). It is better to have 30 minutes of really great instruction time, then 30 minutes of instruction and 30 minutes of whining and threatening because your child is tired and needs a break. Now for what I think is the most fun...deciding out what you want to cover that year and more specifically each day. I'm not going to tell you what to teach your child each year. There are plenty of books with suggestions, curriculum providers with the year all mapped out for you, and the laws for your state that will tell you what you need to teach. This section is more for deciding how to schedule those subjects each week. I have a column for each of my school-age children and one column for what they will be doing together. Now I start to fill it in with the subjects they will be studying that year. Our next step is where we get to play with the lineup for the week. I like to use the Weekly Schedule from Simply Charlotte Mason. This planner has room for five students and there is a space for Family, subjects that you would do together. I type in my two student's names into the planner leaving lots of space between them, then I print it out. Ignore the large black scribble across the page. Monkey thought this was a sheet for him to color! Grab a pencil (you will probably erase), and start putting your subjects into the days based upon how many times a week you want to study them. Remember your weekly plan you made in the last post. Subjects that might have projects or experiments be sure an put on the days you have the least outside commitments. Look at your week and make sure that one day is not overloaded with project-based learning (unless you have a day specifically set aside for that) or too much sit at the desk type of learning. You want to have a balance...it just makes school more fun. Also make sure that you haven't overloaded your child one day out of the week with quite a few more subjects than another day. A quick glance at my weekly plan tells me that Chipette will have about 9-10 subjects each day, Magpie has 6 subjects each day, and they have 2 subjects (possibly three) that they will do together. That seems about right to me, but Magpie might have too much for Kindergarten, so I'll just have to see how it works out when we begin. At this point I have completed my plan for the year. I have my entire year scheduled, the week laid out, and the subjects chosen and put on the appropriate day. Just remember that it is a plan, but make it work for your family. You might discover that you need to rearrange some things, maybe subjects that you need to cut, a week off that needs to be removed or added, or finding out that a certain subject needs to be on a different day of the week due to time issues. Feel free to tweak and change until it fits your family and children perfectly. In the long run, I've found that having a framework makes it much easier to make the changes if you need to do so. Here's wishing all of you a happy and productive homeschool year! You ROCK! This post has just taken a ton of bricks of my shoulders. I had been dragging my feet but now feel pretty motivated- thank you, thank you, thank you! Off to read your follow-up posts! So glad it helped spur your planning for the new school year! Oh this was sooo very helpful!!!! Happy to help, Michelle! Have fun planning! 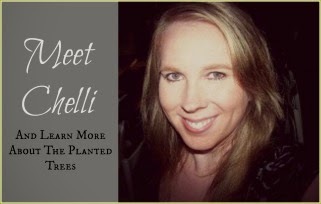 I agree with Michelle! I was trying to figure out how I was going to schedule an entire year for three kids. 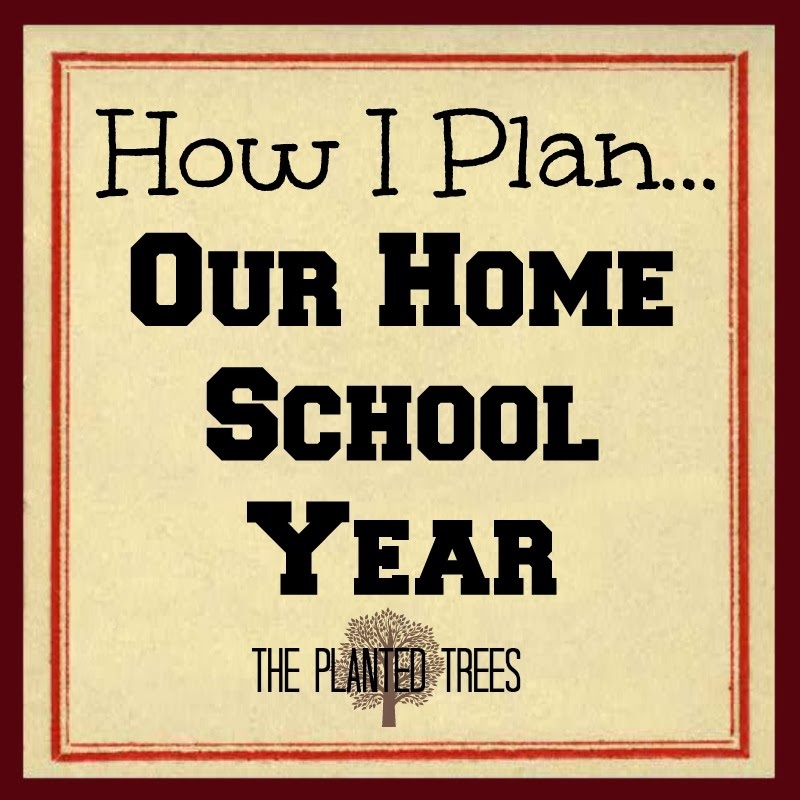 We're only a semester into homeschooling, so the thought of a whole year was a little daunting. Thanks! Glad I could help! To me planning the year is the easy stuff, planning the day to day subjects is the "work" part of it...which is why that blog post isn't done yet! Have a great homeschool year! I told you I would visit your blog when I got home! You have so many great ideas, this will definitely help me, thanks!! That is such a kind thing to say! The entire reason I wrote this post was to break it down for people like me who need a little...okay a lot!...of hand-holding! Love the post! I have to ask one thing though...why aren't you counting your homeschool coop day towards your required days? They are still working on things, though it's not their norm. We don't have required days in our state, so all I'm counting are the days needed to make it through our curriculum for the year. If you are wanting to count co-op days for your state requirements, then go for it! Love seeing how you work through each step :) I do my school planning in very similar fashion - including the Donna Young calendar! Have a wonderful start to a new school year. I love to see each and every step of the process, so I wrote the post that way! You have a great year as well, Linda. I just came across your page and I am so happy I did! This will be my first year homeschooling. I have a 5, 4, 3 and an 18 month old. It was such a struggle trying to come up with a schedule for all four kids. I literally just figured it out while reading your blog! Thank you so much for coming to my rescue! Thanks so much for the kind words, Tiffany! You definitely have your hands full so I'm glad that my post helped. Have a fabulous school year! I have been homeschooling mostly like this for 14 YEARS!! LOL!! I started reading your post and kept saying - that's how I do it! We do the calendar year (36-38 depending on curriculum) just like you stated. 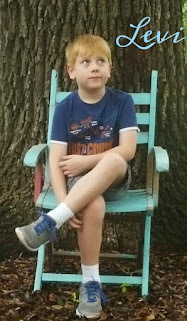 We only homeschool 4 days a week because we have co-op on Mondays :) I do not schedule times for each subject as my youngest is now in 11th grade. The only thing I do a little different is I print out his lesson plan in Word, in sets of 4 per week (in a table format) if that subject is 4 days, sets of 2 for those subjects that are just twice a week. He has a binder with all his lesson plans. Hey Chelli! Thanks for great planning tips:) I used this system last year and it was great. Thank you! I am planning for next year and cannot get to the Donna Young calendar. I have tried several times and keep getting the message "This page does not exist". Is there a new link you know about? Thanks! You may email me at fairytaleseeker@att.net. 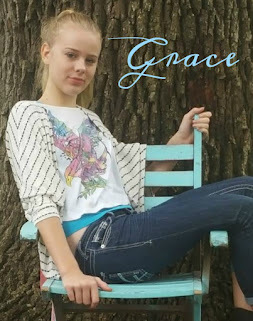 I cannot thank you enough for this blog post. You've helped me out tremendously, I was feeling very overwhelmed and lost on where and how to start our year. My husband is on shift work and we love taking breaks around his hectic schedule. Thank you so much! Summary Saturday: Two Weeks of Fun!